Introductory Material. Vector and matrices norms. The graph of a matrix. Discretization methods for partial diffential equations. Gaussian elimination for general linear systems. Gaussian elimination with permutations (partial piv- oting). Gaussian elimination with other pivoting strategies. Gaussian elimination for symmetric systems. Coding the three factorization algorithms. Tridiagonal and block tridiagonal systems. Parallel solution of general linear systems. Gaussian elimination for sparse linear systems. Graphs and fill--in for symmetric matrices. Band and envelope numbering schemes for symmetric matrices. The Cuthill--McKee and reverse Cuthill--McKee orderings. The Kumfert and Pothen hybrid algorithm. Numerical stability for sparse matrices. Parallel algorithms for sparse matrices. Fast solvers for separable PDEs. The basics of the FFT. FFT on vector and parallel computers. Stability of classical iterative methods. The conjugate gradient and related methods. Generalization and second form of PCG. The convergence rate of PCG. Roundoff errors of CG and Lanczos. Solving for several right hand sides. Krylov methods for non--symmetric systems. The Concus and Golub non--symmetric CG. Construction of basis for Krylov spaces. Definition of FOM and GMRES. Roundoff error analysis of GMRES. The non--symmetric Lanczos algorithm. Definition of the non--symmetric Lanczos algorithm. Variants of the non--symmetric Lanczos algorithm. Roundo# error analysis of BiCG. The Conjugate Gradient Squared algorithm. The Quasi Minimal Residual algorithm. Krylov methods on parallel computers. Incomplete decomposition of non--symmetric matrices. Comparison of periodic and Dirichlet boundary condi- tions. The modified incomplete Cholesky decomposition. The relaxed incomplete Cholesky decomposition. More on the incomplete decompositions for the model problem. Incomplete decomposition of positive definite matrices. Multicolor orderings. The repeated Red--Black decomposition. The block incomplete Cholesky decomposition. The modified incomplete block decomposition. Block incomplete decomposition for H--matrices. Generalization of the block incomplete decomposition. Fourier analysis of INV and MINV. The block Cholesky decomposition for D problems. The ACP preconditioner for D problems. The preconditioner of Appleyard, Cheshire and Pol- lard. The sparse inverses of Huckle and Grote. The sparse inverses of Gould and Scott. The sparse inverses of Chow and Saad. Sparse approximate inverses for symmetric matrices. The sparse inverses of Benzi, Meyer and Tuma. A polynomial independent of eigenvalue estimates. Adaptive algorithms for SPD matrices. Polynomials for symmetric indefinite problems. The choice of the smoothing. The choice of the restriction. The choice of the coarse grid matrix. Domain decomposition and multilevel methods. The classical Schwarz alternating method. The matrix form of the Schwarz alternating method. The additive Schwarz method. Adding a coarse mesh correction. An additive Schwarz preconditioner for parabolic problems. Algebraic domain decomposition methods without overlapping. Exact solvers for the subdomains. Approximate solvers for the subdomains. Approximate Schur complements in the two subdomains case. The Schur complement for block tridiagonal matrices. Eigenvalues of the Schur complement for separable problems. Dependence on the aspect ratio. The Schur complement for more general problems. Approximations of Schur complements with many subdomains. The Bramble, Pasciak and Schatz preconditioner. A block Red--Black DD preconditioner. Multilevel ILU preconditioners. Bibliographical comments. This book deals with numerical methods for solving large sparse linear systems of equations, particularly those arising from the discretization of partial differential equations. It covers both direct and iterative methods. Direct methods which are considered are variants of Gaussian elimination and fast solvers for separable partial differential equations in rectangular domains. The book reviews the classical iterative methods like Jacobi, Gauss-Seidel and alternating directions algorithms. A particular emphasis is put on the conjugate gradient as well as conjugate gradient -like methods for non symmetric problems. Most efficient preconditioners used to speed up convergence are studied. 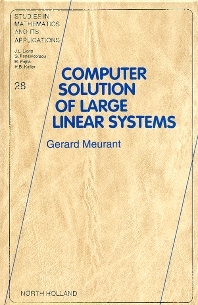 A chapter is devoted to the multigrid method and the book ends with domain decomposition algorithms that are well suited for solving linear systems on parallel computers.